The Monitor & Laptop Clamp-On Monitor Arm / Monitor Mount / Monitor Stand will lift your laptop computer to a more ergonomic viewing height. When used in conjunction with a separate keyboard, mouse, and monitor, this gives you all the advantages of a desktop computer with a dual monitor setup while at your desk...without sacrificing the convenience of owning a laptop for on-the-go use. In addition, this monitor stand gives you the ability to twist and rotate your monitor to the perfect position (you can even view it in portrait orientation). Say hello to working smarter – not harder. AND say goodbye to any neck or back pain! The Stand Steady Monitor & Laptop Clamp-On Monitor Arm / Monitor Mount / Monitor Stand will give you endless possibilities to use your laptop in a way that best suits YOU! GET RID OF BACK + NECK PAIN: Set your laptop screen to your correct ergonomic height, distance, and tilt. FITS MOST MONITORS & DESKS: The Stand Steady Monitor Mount will work great on practically any standard office desk with a rear edge up to 3.46 inches thick or grommet hole. It will fit one monitor up to 32 inches in size and up to 17.6 lbs. and one laptop between 10 and 17 inches and up to 9.9 lbs. EASY TO INSTALL: With easy to use quick release VESA mount, you can install your monitor in seconds! Before buying, make sure your monitor is VESA compatible! Look at the back of your monitor: If your monitor has four holes in a square shape - you're good to go! 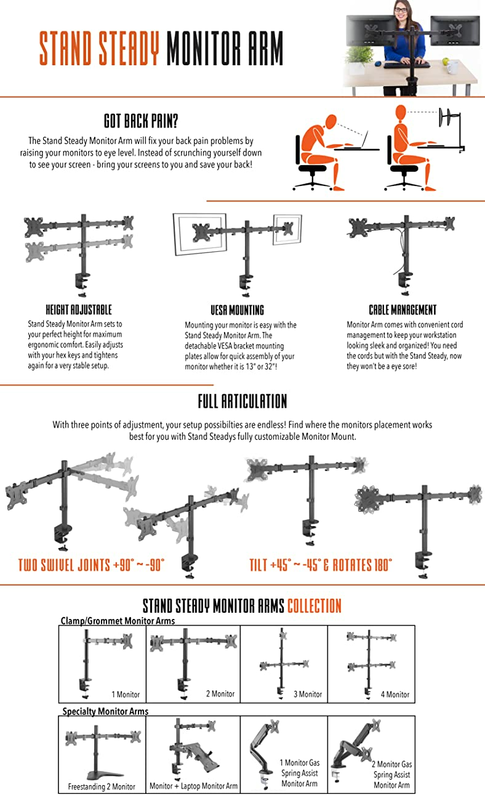 BONUS CABLE MANAGEMENT: The monitor stand offers handy cable clips on the arm and center pole to keep your cords in place and your workstation organized! WEIGHT LIMIT (Monitor): 17.6 lbs. WEIGHT LIMIT (Laptop): 9.9 lbs.